Selecting an energy efficient air conditioner for your home is a big decision. At Boerne Air Conditioning Experts, we understand that it’s an important investment today and it will play a key role in your home energy expenses for years to come. And when the summer heat is at its worst, you’ll want your family to have the best, most reliable cooling comfort possible. ​Here are a few things we suggest that all our customers consider. Finding the right equipment can be hard, but keep in mind that all good central air conditioners have a few things in commons. 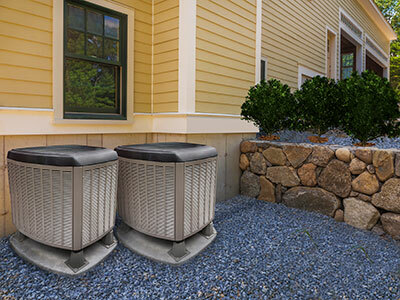 The best air conditioners are efficient and operate on minimal electricity to hold utility bills down. They provide steady, dependable performance year after year when properly maintained. Good systems are also quiet, long-lasting and low in service needs. It’s also important to think about what really makes an air conditioning unit “energy efficient.” Similar to automobile manufacturers, today’s air conditioner manufacturers are required by law to evaluate and rate their equipment according to its energy efficiency. This rating is known in the industry as a SEER, or Seasonal Energy Efficiency Ratio—the higher the SEER rating, the more efficient the equipment. Air conditioners with variable speed and 16+ SEER ratings are the most efficient, while 13 SEER is good and 15+ SEER is even better. Most new homes with central air come equipped with a standard builder’s model; however, when replacement becomes necessary, property owners can upgrade their air conditioning by specifying a more energy-efficient system. Models with a higher SEER rating are generally more expensive, but they can easily make up the difference by reducing your home energy bills in the long run. In addition to SEER ratings, you should also be conscious of a unit’s size. Having the wrong size AC system can lead to multiple problems. A cooling system that is too big cools down the temperature very quickly, but it does not run long enough to remove sufficient moisture or humidity from the air. This results in you feeling cool but clammy. Then, many people turn down their thermostats to make the air conditioner run longer, increasing the utility bill and the amount of energy used. In some cases, the insufficient moisture removal resulting from over-sized cooling equipment can lead to mold growth and other types of moisture-related damage. A correctly sized cooling system runs long enough to wring moisture out of the air, which allows you to be comfortable at a slightly higher thermostat setting and saves you money on your utility bill. It also takes care of the feeling of “mugginess” without making you feel too cold. It’s also important to mention that air conditioning systems are sized in “tons,” which is a measure of the rate at which they deliver cooling, not how much they weigh. It’s better to have a system that supplies a little less than the required tonnage of cooling, rather than a system that supplies more than the required tonnage of cooling. We understand that finding the right energy efficient air conditioning unit can be challenging, but just remember at our professionals at Boerne Air Conditioning Experts are always here to help.